Mirror of Fashion: WHAT'S IN MY BAG? Showcasing the inside of my Chloé Drew purse today. 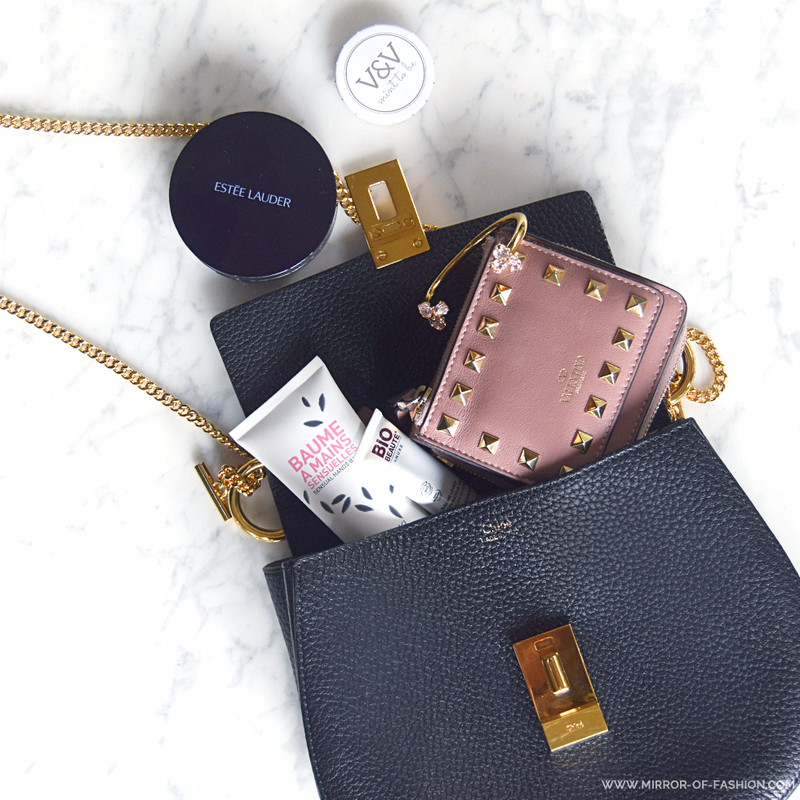 I tend to heave around kilos and kilos on a daily basis; keeping a lot of hair accessories, skincare, make-up and even food in my bag... but when carrying this rather tiny Chloé one I am forced to stick with the necessities. Nothing excessive, just the absolute must-haves. V&V Mint To Be mints, we still have quite some boxes left back from the 23rd of May. And so I still carry these lovely wedding souvenirs with me. Estée Lauder Double Wear To Go is my ultimate foundation of choice. Not only does it provide eight hour natural coverage and all-day illuminated skin, its ultra handy packaging reveals a pea-size dot of foundation with one simple push. Whenever your hands are in need of an extra dose of suppleness, grab for your Kenzoki Sensual Hands Balm. Its rich texture absorbs immediately but leaves your hands nourished and soft. Definitely worth the splurge! Nuxe Bio Beauté Tinted Repairing Lip Balm is the one to rescue my chapped lips every winter. And on top it gives your lips a brilliant and subtle tinted finish. Be sure to check out my video with Estée Lauder here to discover just how brilliant my foundation of choice actually is.